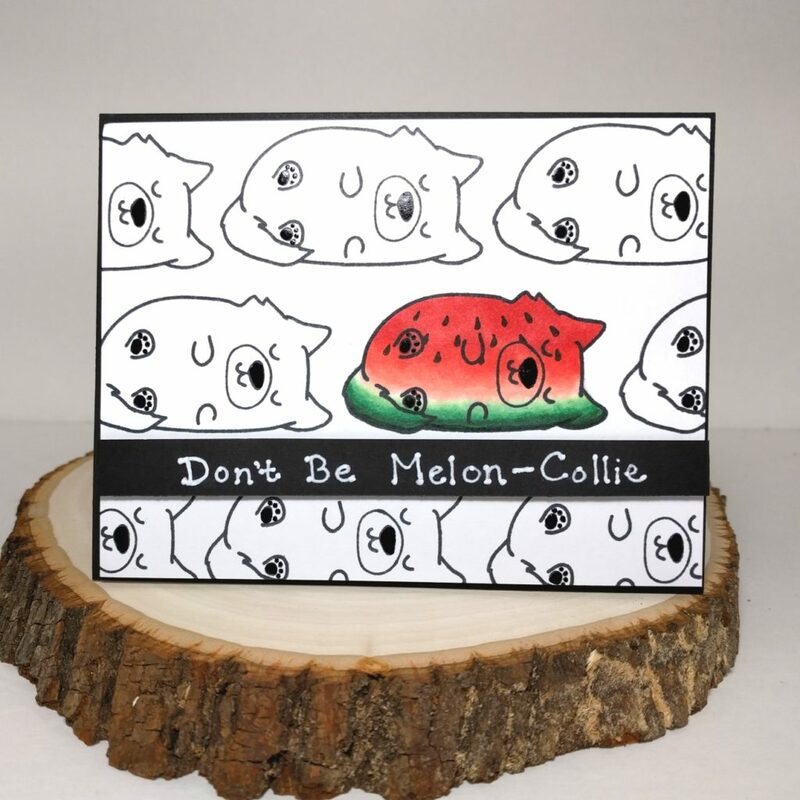 A creative crafting community like ours is bound to come up with some crazy ideas, and Pepita (IG: @pepitahasenkeks), on Instagram, has launched a super fun wave of “melonizing” stamps. I’ve jumped onto the melonizing band wagon with some of my favorite roly poly dogs (of course, I had to try this new coloring technique/theme with dogs)! I first made a card using the pup from Paper Smooches’ “Chubby Chums” stamp set. I thought I could stamp a background with the pup and leave all but one of them in their simple stamped state. 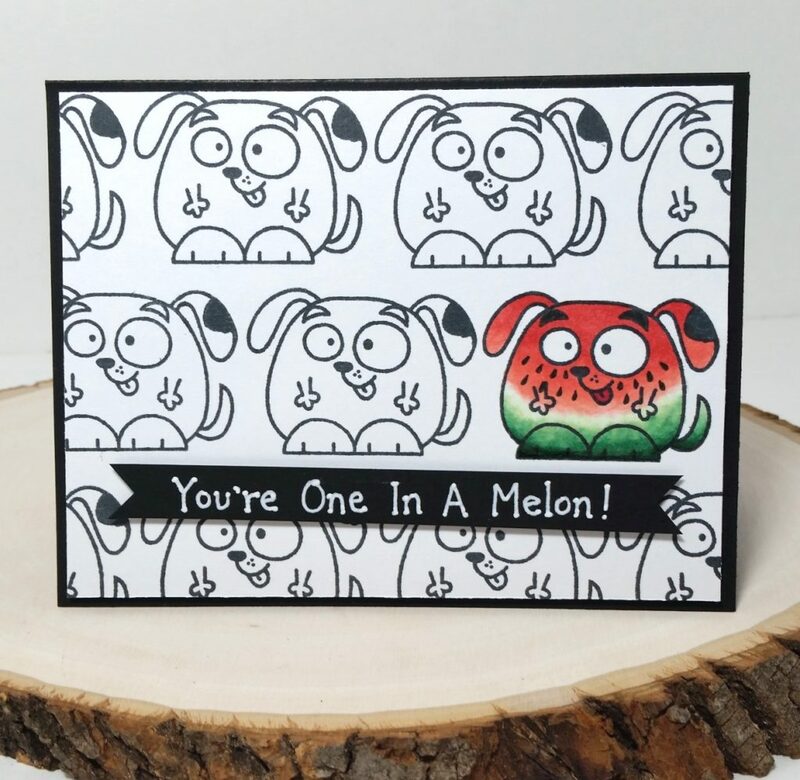 The one chosen pup, I melonized with the following Copic colors, and added a hand written sentiment with a white Stabilo Uniball pen that reads, “You’re One In A Melon!” This is for a friend who has a winter birthday and is turning 60 soon, but really likes the summer (especially summer fruits). To help blend the light green and pale pink, I used the 0 blender, and I drew in the seeds with a 0.1 Copic multi-liner pen. I also used a black Sakura Glaze pen on the nose and paw pads of all the dogs on the second card. I thought that without the eyes open on these pups, they needed a little more of a shine element to help them pop a bit. I made the second card using one of the pups (the one that most looked like a collie to me) from The Greeting Farm’s “Lucky Dogs” stamp set (this is a new-to-me set I picked up during The Greeting Farm’s last Farmer’s Market Sale). I used the same Copic colors, and hand wrote, “Don’t Be Melon-Collie” for the sentiment. This card will be sent to a friend who is having a really rough time lately, and I hope it will cheer him up (or at least bring a smile to his face). How fun! Thanks for introducing me to melonizing! We thank you for sharing your cards with us at the Simon Says Stamp Wednesday challenge this week! This is cute and such fun! Your puns are as delightful as your technique. Thanks for showing off your art work at 613 Avenue Create. haha, cute!! 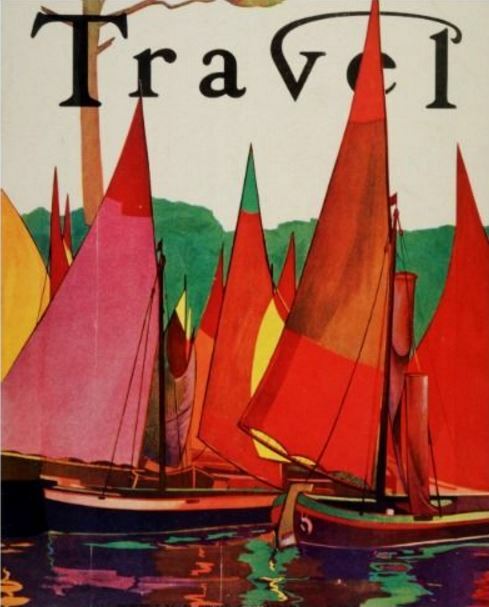 such fun cards and the sentiment is perfect. these would brighten anyone’s day. thank you so much for playing along with us at penny black and more. Thanks bunches for stopping by, Rachel! Definitely try this melonizing. It’s so fun and you’d be great at it, I’m sure! Bwaahahahaha – this just made me roar with laughter. …. ‘ Melonizing’ ……. LoL …How AWESOME !!! I have to go try this one. Cute cards. Thanks for the video and all the tips! Thanks so much for stopping by and leaving such sweet crafty love! Thank you soo much for taking part in our “anything goes with optional Winter” challenge over at Creatalicious & good luck in the draw. 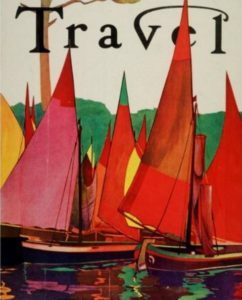 Great tutorial and tricks. Thank you! super cute cards! Thanks for playing along in the 613 Avenue Create Challenge. 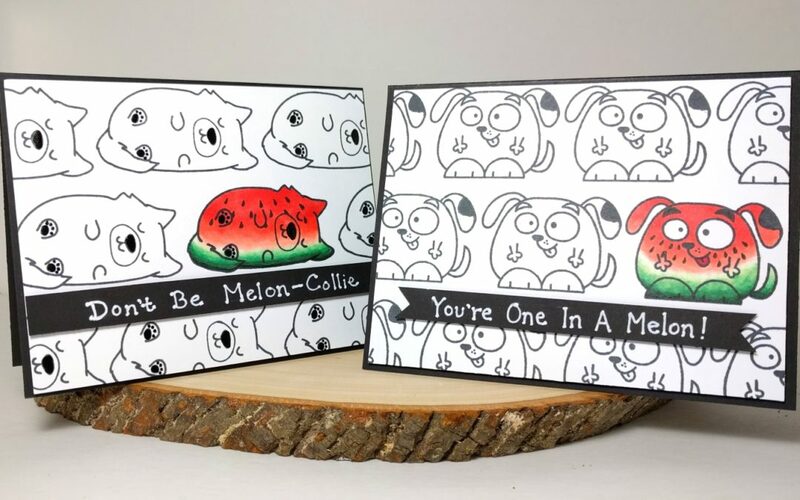 Super cute “melon” critters!! So clever!! I love the Melon-collie! What a clever idea! I was poking around looking to see if there were any new digis you’d made (I miss them. Especially the dogs and kitties. :)) and found this adorable card or *both* of these adorable cards, rather. I must have missed it when it was posted. Adorable!